1. I didn’t need to homeschool preschool. 3. Every family, and every child, is different. 4. For me, homeschooling means staying at home. 5. I have to really want to homeschool. 6. I have to take regular breaks. *The starred items that appear in this blog post are ideas I heard from a video (as in VHS) series from my local library (yay!) called “How To Homeschool the Early Years.” It was made in the late 90’s (hey, I said it was VHS . . .) and was designed for parents of children ages 2 to 9. It was produced with the idea that not all parents are able to attend a homeschool conference, so the video series brought the conference to your home. 1) I didn’t need to homeschool preschool. This is one of the most practical and most freeing things I’ve learned about homeschooling. Everything that must be done in Kindergarten – learning basic math facts and how to read – can be done in Kindergarten. Other learning tasks, like colors, shapes, and sorting and stacking, happen naturally in family life, and you don’t need a workbook for them. Truly, for children with lots of books, games, and siblings to play with, preschool is redundant. Through their book Better Late than Early, homeschool pioneers Raymond and Dorothy Moore popularized the idea that a child’s formal education needn’t be rushed. * I didn’t listen to that advice the first time around. I was eager to start homeschooling and didn’t want my little four-year-old to fall behind in life (paranoid much? ), so I started him on math and reading lessons. Later I realized that was sort of pointless — and that the Moores were right. So with my second child, I didn’t do anything specific for pre-school, other than have him listen to what I was reading aloud to my oldest. I did the same with my third, and plan to repeat that process with my fourth. All you really need for preschool are some crayons and paper, a bunch of library books, and some developmental toys. While the library is free (I was virtually addicted to my public library in the States), toys and games require some money (sorry). Trotter preschoolers usually gravitate the most to magnets, pegs and pegboards, and Wedgits. I myself have been known to play with said toys for hours at a time, so I can attest to their enduring allure. Another easy way to fill preschoolers’ minds with stories and expose them to language is giving them books on tape/CD. (Bonus: Mom gets a break.) My kids still love listening to books on tape while they build their Lego “creations.” I sometimes miss the simplicity of those early years, when all I did all day was nurse babies, read books with my children, and cook them meals. Now I have many more curriculum needs to balance. The co-op I participated in was fairly low-key, but it was perfect for me at that time in my life. It allowed me to get out of the house, which was a sanity saver, and gave my kids opportunities to play group games and take art, science, and cooking classes. It was also an ideal outlet for me to teach my favorite subjects — math and science — in a sometimes-mind-numbing season of motherhood. I gained so much wisdom and perspective from experienced homeschool moms, even when my approach to school and family life was different from theirs. I collected their practical ideas and their curriculum recommendations, and I shuffled them over and over again in my mind as I researched the various homeschool methods and tried to decide what was best for our family. Getting out of the house was so important for dealing with the intensity of small children in my home. Another way I did that was to attend the weekday Ladies’ Bible Study that met at my church. Bible study broke up the monotony of life at home with littles. I learned so much from older Christian women, and they helped me through some very tough times — depression, death, infertility. I attended for years, and I remember those years fondly. They were so good for my spiritual growth at a time when I really didn’t know what I was doing with regard to faith and motherhood. 3) Every family, and every child, is different. Then I went through the exercises to define my educational and family goals, which, in combination with the learning styles and teaching styles, helped me settle on the homeschool methods I use. Her book gave me clarity and confidence in my decisions, and it also helped me understand why there is so much diversity among homeschool families. Everybody is different, and my homeschool won’t look like yours, and that’s ok. It’s actually good, because we’re all doing what’s best for our own families. I also learned that each child might learn differently, and won’t be able to learn the same way as a sibling does. What is easy for one child is not necessarily easy for another child – and that’s ok. All children have harder subjects and easier subjects. They learn differently. I am here to be patient with their individual differences, but I am also here to celebrate my child’s strengths. 4) For me, homeschooling means staying at home. This might sound like it contradicts #2 and my love for co-op, but it’s been my experience nonetheless. When my children were younger, I needed to get out of the house and find some camaraderie with other moms. But as my children have grown, so have their educational demands. There is more to do now, and I simply can’t afford time out of the house on a weekly basis. I once heard Monte and Karey Swan talk about homeschooling, and Karey’s statements especially stayed with me. * They had pulled their kids out of the public school system so they could be more intentional in their discipleship and also so they could “move into creativity” as she called it (they were a very creative family). But then they found themselves driving all over town for co-ops, athletic practices, and music lessons. They didn’t have the time to do all the things she really wanted to do. Suddenly Karey realized she was “carschooling” instead of homeschooling, and their homeschool activity choices were defeating the purpose for which they removed their children from school. She wanted to be at home more, so they could move into creativity, so they could read together more, so they could have those deep discussions with their all-too-quickly-maturing children. So they quit the outside activities and centered their life around the home, and their family thrived in that environment. Monte and Karey’s gentle approach to parenting appealed to me, and their story stuck with me. Later I would experience a version of their story myself. In our first year overseas, I didn’t know many homeschooling families, and our kids didn’t have many friends. 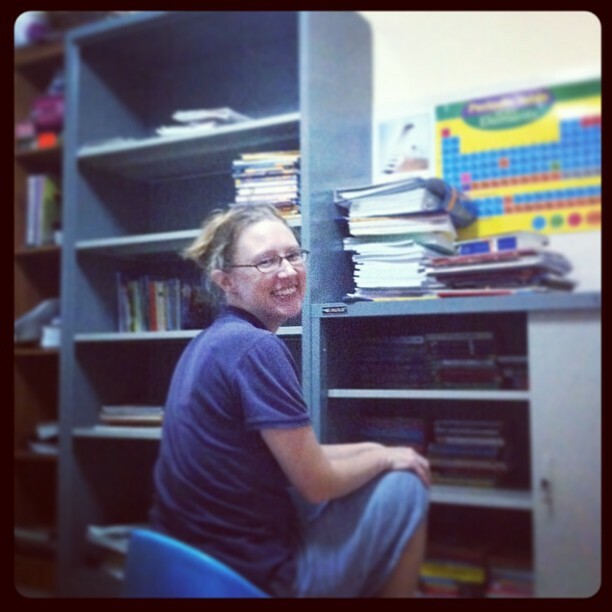 So I started a co-op with some other moms, and at the time, it was such a blessing to meet other homeschool moms in Phnom Penh and to watch my children form friendships with other kids. But after about six months of co-op, our gatherings no longer met the needs of any of the families. So we disbanded. Our co-op was a success, though, because I’m still friends with those moms, and my kids are still friends with those kids. However, as my kids grew up more, their schoolwork started to pile up more too, and we couldn’t make weekly or bi-weekly commitments anymore. It’s not just our educational needs that keep us mostly at home; it’s also our emotional needs. We are a family of introverts. Both my husband and I are introverts, and all my children have some introverted qualities. That means that a week of getting out of the house every day or almost every day will wear.them.out. My kids will get cranky, and they won’t even understand why they don’t feel good. Too many outings mean I’ll be too exhausted to read aloud to them for fun, or play games with them. I’ll be too tired to connect with my husband on a deep level. Every day, my children need time in their rooms to simply play, quietly and alone. They need that downtime to be able to concentrate properly on their schoolwork, and we give it to them on a regular basis. Their Mommy needs to be at home, too. I like to write, I like to play the piano, I like to exercise. None of those things gets done when we are scurrying to and from activities, no matter how good those activities are. Mostly staying at home is best for all of us. 5) I have to really want to homeschool. Of course, that’s just my story. It’s ok if you don’t want to homeschool. There is no one-size-fits-all family education plan. Every family is different (see #3 above), and every family makes decisions differently. When I say, “I have to really want to homeschool,” I don’t say it in a we-just-have-to-force-ourselves-to-like-it kind of way. Rather, I mean that for myself personally, I need that desire in order to keep going. If homeschooling is not your thing, that’s totally ok. Homeschooling is just what our family does, and it works for us at this point in time. If you don’t want to homeschool, or if you don’t like it, then it just might not be a good fit for you. Everyone is different, so let’s just move along and let everyone be different. 6) I have to take regular breaks. If I’m going to teach my children at home for the long haul, I’m going to need endurance. And for me, one of the keys to endurance is pacing myself. I have to take daily breaks, decompress, and allow myself to think. I take an hour in the middle of the day to write – that’s when I write emails and blog posts. And I don’t have an open door policy after bedtime. Once we say goodnight to our children, for the most part, they are not allowed out of their rooms. (Although there are exceptions to this rule.) Since I’m with them all day long, I need a breather in the evenings. Some moms might not require that; but I do. Evenings are for my husband and me to spend together. I’m not the only one who needs breaks, though. My kids usually need a short break in between subjects, so I let them have that. That means that with 3 separate grade levels to juggle, in addition to short breaks in between subjects, and my “writing hour,” our school day lasts all day. We are not done at lunchtime like some families, and that’s ok. (It’s also part of why we can’t get out of the house too much.) We have a slower pace because in our family, hearts and minds work better that way. Every quarter or so, we take a Thursday and Friday off. And we take a summer break. It’s usually only four or five weeks because our school years are rather long. School years are long because we schedule a three-month furlough every other year; we have to take time off for third-world-country-sickness; and we host friends and family from the States at various times. Our summers are short, but I need them. I am not mentally equipped to school year round. Families who homeschool year-round make it sound relaxed and non-stressful. As wonderful as that sounds, I simply can’t do it: I need my summer break! Well there you have it, some of the biggest lessons I’ve personally learned in 6 years of homeschooling. And all you moms out there? I want your input! What are some of the biggest lessons you’ve learned in motherhood and/or homeschooling? Please share! I recently moved to Phnom Phen with my four kids in tow. This is my third year is homeschooling and we have no friends here. Is there a playgroup or co-op or anything that would get my kids out of our apartment.